The Continuum 0.5 is a handsome two-way monitor featuring a 6" Aurasound woofer and a 28mm fabric-dome tweeter by Morel. The enclosure is ported at the bottom of the black cast marble front baffle, and thin foam grilles, secured by Velcro, hide the driver arrays. The speaker was designed to be used with its grille in place, and thats how I did all of my listening. I have to tell you that from an aesthetic viewpoint these are beautiful speakers. The internally braced wood cabinet is made from particle-board/MDF/Baltic-birch plywood panels. The differing densities and thicknesses tame resonance. The heavy marble front baffle, which is elegantly contoured for wide dispersion and minimum diffraction, is glued to the enclosure. Handsomely lacquered solid cherry panels are then bonded to the box and suspended/isolated from it by pieces of sorbothane. This arrangement, in addition to looking great, acts to shelter the inner cabinet from airborne acoustic feedback. The cool thing about this is that different custom finishes are available on request (pricing varies with finish) and can be retrofitted at any time. So if the speakers get scratched or you put them in a different room or you just want a different look, you can simply send them back to Green Mountain for a cosmetic makeover. For you budget-conscious folks, the "theater black" panels actually drop the purchase price to $1,250 per pair, while a custom finish like gloss black will set you back $1,795/pr. My review pair of speakers was also supplied with top-grade WBT binding posts, a $200 extra-cost option. WBTs for a biwired pair of speakers add $400 to the base price. My personal feeling is that the lacquered cherry panels at $1,495 are gorgeous, but if you get the theater black finish with WBT posts, the price is the same. So the user must sort out his own priorities here. The woofer employs a rigid treated fiber cone with a vented, underhung voice coil and a shielded Neodymium (I cant even pronounce it) magnet. A simple first-order crossover using one Hovland capacitor and one air-core Solen inductor mediate the frequency-domain rights between the woofer and the tweeter. The network is hardwired (no PC board) with Audio Magic silver Teflon wire. A Morel treated-linen dome tweeter with a hex-wound aluminum voice coil, ferro-fluid cooling, and shielded (wont affect your TV) Neodymium magnet ensure clean and detailed high-frequency reproduction. Inside the enclosure, in addition to the customary strategically situated fiber-fill lining, Green Mountain uses what they call a "golden-ratio" baffle, which is a perforated baffle that allows internal standing waves to cancel themselves out. I spoke with the head Green Mountain guru Roy Johnson, and it was apparent that he was quite proud of this unique and effective innovation. Frequency response is reportedly +/-1.5dB from 100Hz to 19kHz, and the 3dB down points are at 65Hz and 23kHz. The impedance curve is very benign, and nominal impedance is specified as 4 ohms. System sensitivity for a 2.83 volt input is 90dB. The speakers measure 15 3/8"H x 9.5"W x 11 3/4"D, and tip the scale at 24 pounds each. To commence the festivities, I put the speakers on 22" stands about 6' apart (center to center) 4' from the side walls, and 7' from the front wall. My listening seat was set back 10' from the front of the grilles, and about 7' in from the rear wall. Roy Johnson had suggested that the center of the woofer should be above ear level in order to maintain proper phase coherency between the two drivers, and this meant that my stands were a bit too short for the job. Accordingly, I tilted the speakers back slightly and lowered my listening position a few inches to compensate. Yes, these speakers are phase coherent by design. Its funny, but I found that the image tended to shift not only with horizontal head movement but with vertical movement as well. Youll know when its right because the image will deepen and appear straight ahead and back rather than up or down. My digital source was the Parasound D/AC-2000 converter with its partner C/BD-2000 transport. Analog honors were handled by the Townshend Audio Mk-III Rock turntable with a Transfiguration MC cartridge installed in a modified Rega RB-300 arm. The phono preamp was a custom AHT-P, and a Bylux Dedicated Line Filter delivered AC to the motor of the Rock. The R.E. Designs LNLSA-1 preamp drove Clayton Audios M-70 monoblocks via Full Spectrum Signature interconnects. My speaker cable was a 10' run of Luminous Audio Prestige copper wire. "Everybody gather round now, let your body feel the heat. Dont you worry if you cant dance -- let the music move your feet...." No, the Green Mountain Continuums arent disco speakers by any means, but they sure can, and do, make music. Well holy cow, folks, I have to tell you that I was just down in my listening room and Branford Marsalis was there wailing on the sax. He couldnt have been more "there" if he was here, and thats the truth. He was playing "Nearness Of You," which I recognized from his Trio Jeepy album, [Columbia CK 44199] and upon finishing that tune, he opened "Three Little Words" with a loud blast that nearly blew my head off. Yessiree, the little Continuums made a believer out of me. Not only was the timbre spot-on, but the dynamic contrasts -- macro and especially micro -- were delivered so convincingly that when I closed my eyes to listen, I had a very hard time not believing that Branford was actually there. These speakers are super clean, focused, and deliver ultra-fast transients -- accurately and without any hint of ringing, distortion, or rounding off. What that does, combined with the Continuums very smooth and linear frequency response, is to let real acoustic instruments sound very authentic and distinct. 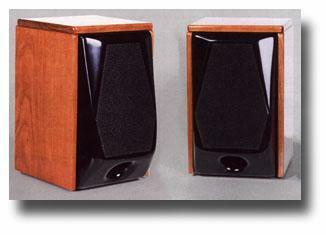 Come to think of it, "distinct" is a very appropriate adjective to describe the sound of these speakers. Even with all kinds of instruments and sounds playing at once and at differing levels of volume, every sound remains clear, distinct, and identifiable. I found the speakers ability to resolve low-level details to be unsurpassed in my own venue. It was uncanny how the Continuums allowed one to eavesdrop on the background conversations going on in live recordings such as the Ray Brown Trios "The Real Blues," from Summer Wind [Concord Jazz CCD-4426]. At one point, I could hear the audience laughing at one of the band members poking fun at band leader. This was certainly hinted at with my other speakers, but it was plainly more discernible via the Green Mountain Continuums. As much as I like the high-frequency reproduction of my Paradigm Reference Studio/100 speakers, I believe the Morel tweeter as implemented in the Continuums sounds even better. It is clearer, smoother, more detailed and more extended. I do not believe the difference is large, but when I listen to both speakers side by side, I have a clear preference for the upper-octave authority that the Continuums are able to demonstrate. High-hats, cymbals, and all genres of high-frequency percussion instruments are extremely well served. In comparison, the Paradigms are a bit more splashy and a bit less articulate. The midrange of these speakers seems very linear and does not exhibit the slightly recessed or darker character of the Paradigms in the crossover region. One word of caution may be in order here. Precisely because the high-frequency reproduction is so acute and extended, these speakers will not be kind or forgiving to bright- or grainy-sounding associated gear. They will expose any such flaws with the same deft accuracy that allows them to unravel and expose musical subtleties and fine low-level details. As the saying goes, "Dont shoot the messenger because you didnt like the message." What about imaging? To my ears these little honeys are the very model of precision when it comes to layering a soundstage. They are exacting, stable and very focused. They throw a very deep and respectably wide presentation that needs no apology. The electronically encoded four-channel effects on Madonnas Immaculate Collection album [Sire/Warner Bros. 9 26440-2] were exquisitely delivered. Sit down to listen to a cut like "Vogue" because youll have Madonna whispering "vogue" right in your ear! Symphonic works are surprisingly well served too, despite the inability of speakers to provide realistic levels of fullness and weight in the lower octaves. As previously noted, the Continuums bass response starts to roll off below 65Hz. However the quality of the bass is first-rate -- tight, agile and tonally accurate. It does an impressive job of handling drum kits and runs on acoustic bass, losing just a bit of body on the lowermost notes. The bass drum on Stravinskys LHistoire du Soldat [Everest EVC 9049], for example, was rendered taut and powerful, just missing that last ounce of gusto that larger speakers can provide. Truth be told, the only place that the speakers lack of bass extension really bothered me was not on drums or acoustic bass, but on the lower reaches of piano. Although the middle and upper registers of this complex instrument were stunningly reproduced, when the pianist delved to the lower keys of the 88, the heroic little speakers just couldnt portray the grandeur and body of the magnificent instrument. The powerful opening bars from Chopins Scherzo, Op. 11 from PopeMusics Reel 3 Sampler [PMG 04] clearly demonstrated this point. From my previous commentary I believe you can tell that I like these little gems very much. Not only do they sound magnificent, but they look fabulous. For the best performance, the sweet-spot can be somewhat limiting, just as it is with many other highly rated speaker systems. Also know that proper positioning is critical and that repositioning the speakers by tiny increments can result in substantial sonic improvements. It seemed to me that these speakers needed more toe-in to sound their best, as opposed to other speakers Ive tried that do well facing straight ahead or with minimal toe-in. Youll find that properly set up, the Continuums provide a clear, detailed window to the soundstage that is surprisingly dynamic, fast, and rife with natural timbres. While a little shy in ultimate bass extension, the speakers are well above average in terms of bass articulation and neutrality. Orchestral fortissimos were impressive in their delivery, but I found that the speakers ability to deliver subtle gradations of micro-dynamics and low-level details to be exceptional. The reproduction of acoustic instruments as well as the human voice was startlingly authentic, and the treble frequencies were airy and extended. In fact, the treble quality was much clearer and more detailed than most other speakers Ive heard. It was quite wonderful when paired with the Clayton M-70 monoblocks, which excel in their refined treble presentation. What Im telling you is that if youre in the market for high-quality compact monitors for which you neednt apologize to even your most jaded audio-cronies, then you simply must have a serious look at and listen to the Green Mountain Continuum 0.5s. It almost scares me to think of the sonic splendor these potent pixies might achieve when properly mated to a good subwoofer! Oh, by the way, Green Mountain Audio makes some excellent subwoofers, the Continuum 12SW and 15SW, that should fill the bill nicely. Happy listening!